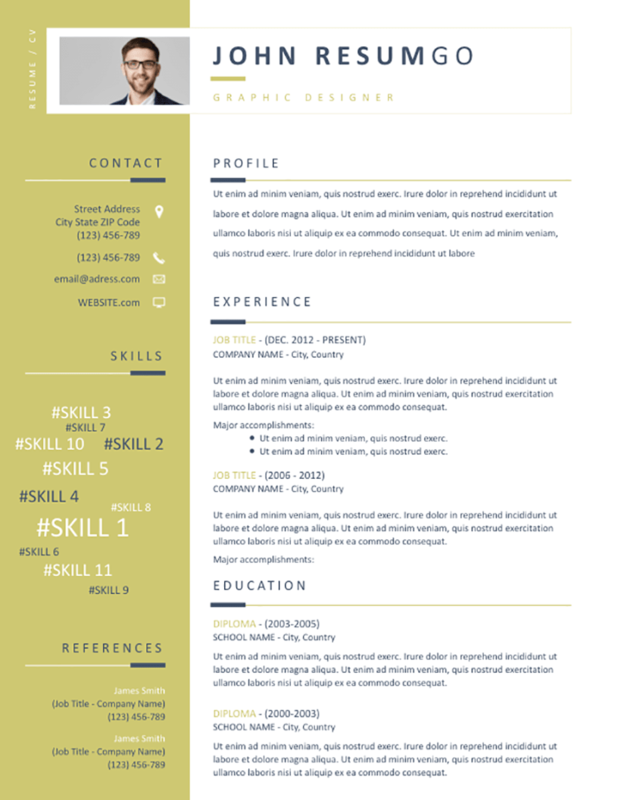 Erato is a free efficient resume template with a khaki color left side. Modern 2-column structure layout on a white background. Your name and title are lightly highlighted thanks to a slight border frame. Each section title is underlined with a full width line plus a short and thicker one, giving the layout a modern style. The left part of this model is a khaki / gold column, and presents your personal information, your skills and your references. A word cloud (or tag cloud) format visually represents your skills (adapt the size of the font according to your level of knowledge). The right side presents, in a very simple and professional way, your profile description (or objectives), your professional experience as well as your school curriculum.